While a student taking MN121 - Mechanical Detailing at MassBay Community College, our team partnered to solve a real-world problem presented to us by an Engineer at SMC Ltd. SMC had an injection molding machine that would occasionally fail to remove the gasket it was making. This required an operator to watch the machine to stop it when it failed. To automate the process, SMC chose a monochrome camera to watch this gasket and send a signal to stop the mold machine if the gasket got stuck in it. This camera needed an adjustable and easily removeable support arm. One of the parameters stated that the arm be adjustable by tools only to prevent an employee from moving the camera inadvertently. Enter Team JLA (Jim, Lidia and Adetunji). Our solution is shown below. We developed a mechanism adjustable by two locking hinges and lengthwise tube system. We used commercial off the shelf parts whenever possible, including a camera stand ball joint to allow the camera to be positioned properly. SMC provided us with an interface control document to dictate important space considerations. This document shows roughly where the camera and camera arm support can go, and how it should be adjustable. Here you see our thinking in the two sketches. The one to the left shows how the camera arm can be removed from a holder with captive screws. In reality, we were able to mount the holder, using standoffs, to the mold machine body so that the camera arm can move straight upwards. The sketch to the right shows a preliminary idea of what parts we were able to find through Google searches. The final camera arm assembly drawing shows all the parts needed to install the camera arm. Every machined part has its own drawing. The hardware and other parts are shown in the Bill of Materials. We also researched the costs associated with making the assembly. SMC told us that machined parts roughly cost $60/hour. The rest of the parts have accurate prices and the BOM shows the vendor or manufacturer. The total cost of $700 is probably an overestimate. 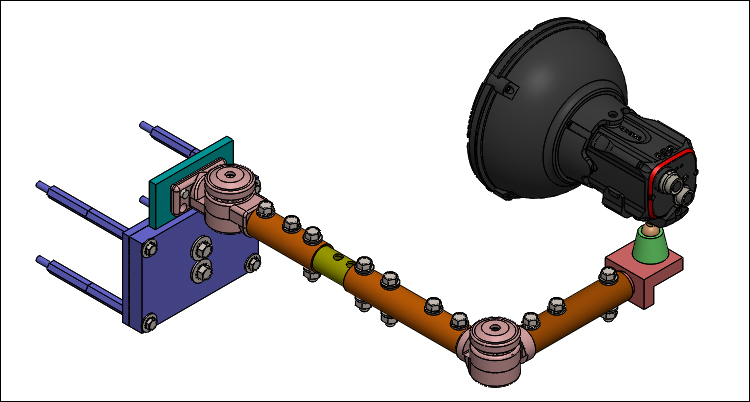 Here is a fully defined production drawing of the part that encased the arm assembly. This drawing shows the adjustable tube we developed. It fits inside two other tubes. This camera arm design was completed at the end of our semester and handed off to SMC Ltd. with a full drawing package on Monday, December 19th, 2016. All Artwork ©1996 - 2019 Jim Bures | All Rights Reserved.